I once had a very effeminate tomcat, named “Missy” . Having nothing better to do, he would stare out of my office window to in order guard our house against low-flying ravens. But you see, when I was working at my keyboard I also liked to stare out of the same windows. The laws of physics, being what they are, prevent two things from being in the same place at the same time – unless you squash one of them badly. So, Missy would jump on my keyboard and leave messages like “dtfdtrftr wrtft99 9%%6&.” This taught me to save documents frequently. Missy’s gone to Cat Heaven where he edits a blog, known as “NUYTTJL PPGHHJ” but his ghost still creeps onto my laptop. You see, like most laptops, mine has a tiny touch pad. This isn’t too bad when you’re forced into a birth position on a airplane seat. However, I prefer to use a genuine $5 mouse whenever I can get to a desk. So, when I type, my fingers press the keyboard but my palms rub over the touchpad. The cursor jumps to some amazing places and introduced great phrases like, “dsaere5". Damn that cat! There are two solutions to the problem: 1) Unplug the mouse, or 2) Turn off the touchpad. Well, Monty Freaking Hall, I’ll open Door #2. Some laptops allow you to use a function key to disable the touchpad but mine doesn’t have that feature. 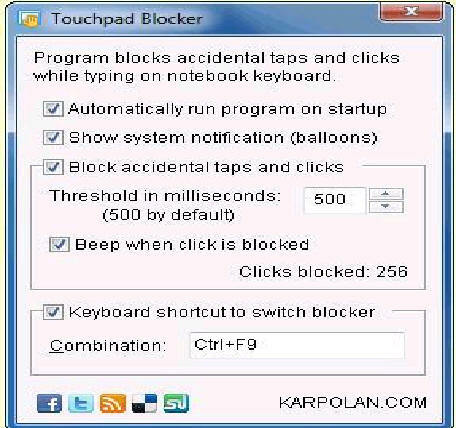 So, when I became aware of a tiny freeware program, Touchpad Blocker (http://karpolan.com/software/touchpad-blocker/) my life changed for the better. This program doesn’t really turn the touchpad off. Rather, it sets a time window in which a press can probably be considered to be an accident. For example, if you set the time threshold to a half- second, then a quick contact to the touchpad would be ignored but a long hard press (how sensuous!) of around a second would be considered to be a genuine contact. The image bellow might be much better than my gasbag explanation. So, my documents have been exorcized of ghosts and my contacts with Missy will be limited to warm, fuzzy memories and old photos. Bye-bye, Furface!